And now we begin digesting the B&H WPPI 2018 specials, starting with select Fuji GF lenses for their medium format system getting a $150 B&H Photo gift card with purchase. Eligible lenses show this on their product page. UPDATE: oops, I forgot to mention this, you also get a $200 B&H Photo gift card when you purchase the new condition Fujifilm GFX 50S with the 110mm f2 lens for $8299 with free expedited shipping. The new condition Fuji GF 23mm f4 R LM WR medium format lens for their GFX Medium Format System is on sale for the Black-Cyber-Monday sales for $2050 at authorized dealers such as Adorama… But if you want to save more, you can get it in “Used – Like New” condition (damaged original packaging) for $1229 by Amazon Warehouse Deals itself (3rd-party sellers not eligible) thanks to a limited time 20% off automatic in-cart discount. This is a “deep cut” both in terms of price and in terms of being a niche within a nice product. The new condition Fujifilm H Mount Adapter G for GFX 50S goes for $660 in new condition at authorized dealers sucha s Adorama. It is used to mount Super EBC Fujinon HC lenses to the Fuji GFX 50S camera. But thanks to the 20% off in-cart promotion at Amazon Warehouse Deals (AWD), you can get this in USED – Like New Condition (original packaging) for $230 after the 20% off in-cart discount, sold and shipped by AWD itself. Their shopping cart is the ultimate decider on what’s eligible for the coupon and which amount. Already available for the price of a very nicely accessorized 4-door sedan ($33k) is the 100 megapixel 53.4 x 40.0mm CMOS Hasselblad H6D-100c Medium Format DSLR Camera, but if you want your other medium format bodies to have access to 100 megapixel photo-shooting, Hasselblad has announced today the H6D-100c Digital Back. No pre-orders yet, check with your favorite medium format retailers for more. And now to our weekly Medium Format post 🙂 The new condition Hasselblad H6D-50c Medium Format DSLR camera is on sale for $14,495 for a limited time with free expedited shipping at B&H Photo. A new week has arrived which means another round of featured USED Weekly Sales at KEH has been added. These are eligible for 25% off with permanent coupon KEHDEALS and continue until Friday night of the same week (eg Friday 9/22/17 in this case). If you are a fan of Large Format cameras and lenses, Friday is the day to be at KEH Camera. Coupon code LF09A gets you 15% off Large Format Cameras and 20% off Large Format Lenses (or Accessories) using hte coupon code. The coupon code expires Friday 11:59pm ET. Over 300 items are eligible for this promotion. You can test the coupon and a S&H estimate without creating an account or logging in to a KEH account. A new week has arrived which means another round of featured USED Weekly Sales at KEH has been added. These are eligible for 25% off with permanent coupon KEHDEALS and continue until Friday night of the same week (eg Friday 9/15/17 in this case). Another one of the KEH Weekly Deals using 25% off coupon code KEHDEALS is the definition of a “Deep Cut”, it is the used Leaf Aptus 22 Digital Back for Mamiya 645AF Series & Phase One sold in AS-IS condition with NO warranty and NO returns. The coupon drops the price from $379 to $284~. Shipping is extra. NOTE: this is sold AS IS! Check the product description over there. Offer ends Friday or earlier if sold out. The Fuji GFX-50S medium format body only goes for $6500 in new condition at authorized dealers, some of which offer a $650 trade-in discount, eg Adorama, IF you are willing to trade-in a top tier DSLR or MF camera. If you are willing to go the used way, authorized dealer OneCall has it in Open-Box Condition for $5799 with free shipping. They also offer it through Amazon Warehouse Deals. The floodgates have finally opened for the Fuji GFX-50S, it is now in-stock at multiple dealers for its starting price of $6500 including Amazon itself and various 3rd-party sellers over there, along with B&H Photo and Adorama. When you expand the yellow “Special Offers” section at Adorama, they have a variety of combined purchase discounts if you buy the camera with various lens adapters and accessories. For the big picture, check the Stock Status Tracker. If you prefer to buy camera gear from Amazon itself, not from 3rd-party sellers, Amazon itself has the Fuji GFX 50S medium format mirrorless camera in-stock for its starting price of $6500 with a limit of up to three units per customer. If you are fond of buying from eBay, Kenmore Camera has it in-stock for $6500 as well. 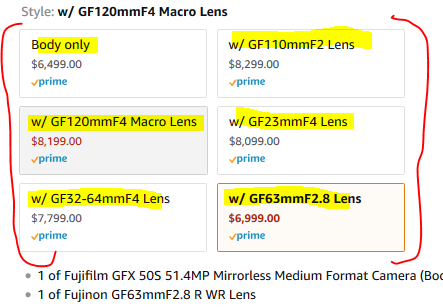 New addition to the Stock Status Tracker, the Fuji GFX-50S, it is in-stock for $6500 at multiple dealers, but if you are comfortable with used, you can get it for $5979 by Amazon Warehouse Deals itself (Amazon’s used sales persona, Prime eligible for members), or for $6000 by OneCall (Prime eligible) with a 1-year warranty from OneCall. Amazon’s own Warehouse Deals only promises a 30-day return policy, they don’t promise a warranty. From there, Adorama has it in “Used – Demo” condition for $6349 plus shipping (which is very close to the new condition price). It is in-stock in new condition for $6500 at the usual places, including Adorama and B&H Photo and Amazon. Keep in mind, B&H and Adorama orders will ship beginning Wednesday April 19. PS: blanket warning reminder for Amazon ~ Amazon has yet to figure out how to block the armies of spam/scam/bot sellers that offer high-demand items at ridiculously low prices in order to harvest customer data (and who knows what else they plan). These are typically “Just Launched” sellers, and they ask you to email them before buying. Oops, I forgot to add this to the Stock Status Tracker but it is already in-stock, the new Fuji GFX 50S medium format mirrorless camera is in-stock and ready to ship for $6500 at Amazon by Amazon itself. Limit three per customer. It’s hard to take pictures without a lens, the Fujinon GF 63mm F2.8 R WR is also in-stock for $1500 with free shipping with a matching limit of three per customer as well. All of today’s new Fuji cameras and lenses have been added to the Cameras and Lenses of 2017 tracking page, where Mirrorless are leading DSLRs with a 4-1 score. A comment by S.W. Anderson in the Hasselblad MF Mirrorless post got me price-checking medium format cameras, and it looks like the first generation Pentax 645D body only is currently going for $4000 in new condition at Amazon by Amazon actual. This is no longer available from B&H and Adorama. Amazon’s shipping estimate is 1-4 months, so keep that in mind if you need it to arrive quickly. In comparison, the latest model, the Pentax 645Z, goes for $7000 in new condition at B&H Photo (with 4% rewards = $280~) and Adorama (with 4% rewards = $280~). There’s also a 645Z Comprehensive Starter Kit that goes for $16,000 and includes three lenses (55/2.8, 90/2.8, 28-45/4.5, extra accessories and the protective case you see in the pictures. Hasselblad has revealed eight new medium format lenses (a mix of zooms and primes) and they are available for pre-order at B&H Photo with prices ranging from $4260 to $8160. New Hasselblad camera gear have been revealed and they are now available for pre-order at B&H Photo as follows: the Hasselblad H6D-50c Medium Format DSLR Camera for $26,000 (50mp), the Hasselblad H6D-100c Medium Format DSLR Camera for $33,000 (100mp) and nine Hasselblad HC Lenses (eight primes, one zoom) with prices ranging from $2970 to $6010 (the zoom). The cameras are expected to ship in June, while the lenses at the end of April 2016. As usual, estimates are estimates and can change over time. These too have been added to the New Cameras and Lenses of 2016 tracking page. Medium format time! 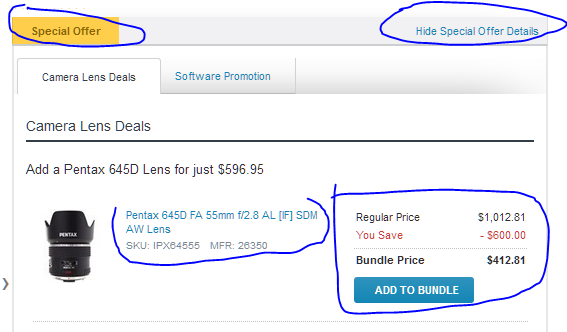 The Pentax 645D body only medium format camera is on sale for $3374 with free shipping and $135~ in rewards to be used in future purchases at Adorama… The same price is available without the promotional rewards at B&H Photo and Amazon. And now to our weekly Medium Format offer, it’s like the Improv, one weekly medium format deal minimum 🙂 B&H Photo has the Hasselblad H5D-50c Wi-Fi Medium Format DSLR Camera on special, the body only goes for $14,500 (in-stock mid-December) while the kit with the 80mm f2.8 HC AF lens goes for $17,100 (in-stock now). And now to our semi-official weekly Medium Format deal (in MF we also include anything with a sensor larger than 35mmFF to keep things simple). There is a sale on 12 different Hasselblad lenses at B&H Photo with prices starting at $2376 (80/2.8 HC AF) and maxing out at $6528 (35-90mm f/4-5.6 HCD Aspherical Zoom). No coupons, no rebates. And now to our weekly Medium Format deal. The Pentax 645Z medium format DSLR body only kit can be bundled with the Pentax 645D FA 55mm F2.8 AL [IF] SDM AW Lens and together you pay $7600 at Adorama. You have to manually press the blue “Add to Bundle” to add the lens to the bundle, and then press the green “Add bundle to cart” to add them both to your shopping cart. That’s it, no coupons, no rebates.